I love the authenticity of the book, but at the same time, I really wish an editor had gone through and ironed some things out. Jaycee's education only went up to fifth grade, and her story would have been less disjointed and confusing if a professional had helped out a bit. Then again, I can see how it was kind of a cathartic experience for her, as if she were going back to her 11-year-old mindset and journalling her experiences... I'm conflicted. 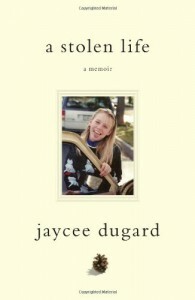 One specific thing that confused me is that I've read online that Jaycee made contact with a neighbor while she was in captivity, but she didn't mention that in her book. It seemed odd to me. I would think that would be something worth mentioning in her memoir. Regardless, it's definitely a difficult, but worthwhile read. i really enjoyed reading this book. it is definitely both disturbing and fascinating. jaycee is not the best writer, but that made it feel more real. reading it felt like she sat down, mentally took herself back 18+ years, and wrote what she was experiencing/thinking/feeling at the time. i can't imagine going through what she went through. i'm so glad she seems to be adapting to the "real world" well. i'll definitely be praying for her and her girls. and i highly recommend this book.